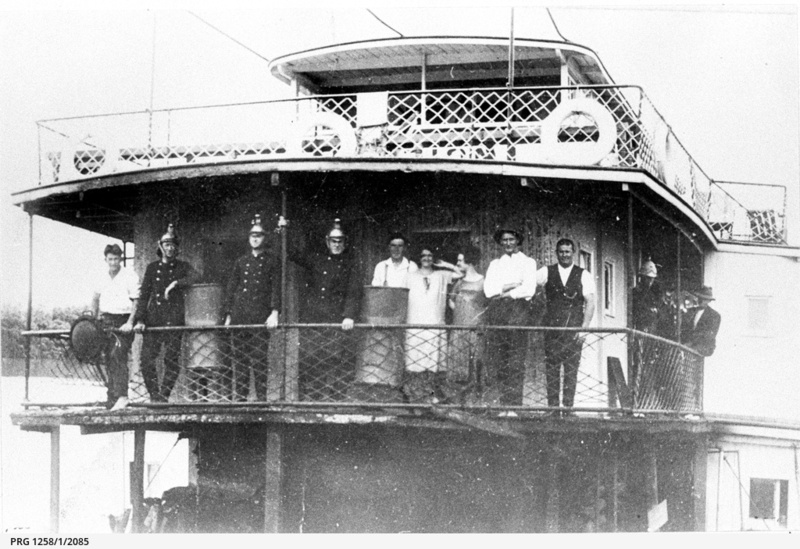 Firemen in uniform and others including women, standing at the rails on the upper deck of 'P.S. Marion', at Murray Bridge after the fire of November 1926. The following people are likely to be among those on board: Reg Gobbett, Bart Wills (purser), Firemen, Mrs. Dillon Head (Stewardess), Myrtle Owen (Stewardess), Cecil Banks (Deck Hand), George Makings (Mate). The names of people in this photograph were obtained from 'The Marion story' by Harry Godson, page 11. Registered 1900 to W. Bowring, official number 112509. Built at Milang, 1897, by A.H. Landseer. (Godson number LL/13).